See the testimonials. Hotels Bali you should book today! Get inspired by the testimonials. Hotels Bali that make your stay perfect are Jimbaran and Kandara! The Karma Group is very proud of the testimonials. Hotels Bali’s Karma Jimbaran lies on the most exquisite location on the Jimbaran Bay; the resort is an attraction itself. The view from the clifftop will take your breath away and leave you speechless. Surrounded by a tropical tick forest looking down upon the ocean, everything here is picture-perfect. Make a reservation at the luxurious Karma Jimbaran and see the splendor for yourself! Some of the best content about the adventures you can find in Bali is in the hotel reviews left by our guests. They describe the local attractions and recommend the must-see places in the Jimbaran Bay. Inside the journals, you can find the Karma Lounge, our on-site restaurant that features delicious cuisine along with a spectacular view. Read our testimonials. Resorts Bali you should put on your travel bucket list are Kandara and Jimbaran. 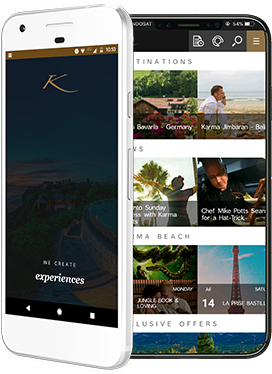 If you want to learn more about the luxurious Karma Kandara, you should read the testimonials resorts Bali section left by our guests. The resort, set on the famous Billionaire’s Row, features villas and cliff-front residences equipped with modern amenities. The suites feature secluded garden patios and private swimming pools. The architecture reflects traditional Balinese culture. The pavilions have local art pieces hanging on the walls and ancient sculptures decorating the airy living spaces. Each villa comes with semi-alfresco bathrooms, and a kitchen equipped with up-to-date appliances. Book your perfect holiday at the Karma Kandara!